A quick update again, just to say that I continue to work on conversations, but have also been trying to consider what options to offer when a PC might be under the influence of invisibility and trying to be stealthy. E.g. What if a player, playing a lone PC, goes invisible with a potion or spell and then tries to do certain actions? I have looked at the various options where this may have an impact, including trying to speak with somebody, trying to sneak past somewhere, or even just moving around ... and came to the conclusion that many situations required a player option as to whether they wish to stay invisible or come out of their invisible state to do the action they are trying to perform. 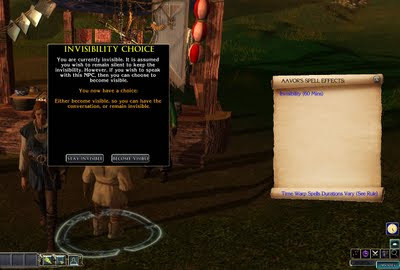 Invisibility and being stealthy to sneak past someone add another level of complexity, and I have tried to be fair in my decisions where such actions may compromise a PC's visibility state, leaving it up to the player if they wish to stay invisible or not. Just the sort of thing I am dealing with as I continue to code the game. Meanwhile, on the home front, Honey, our upstairs rabbit, has continued to improve in health since I last posted, so that is one less concern affecting my concentration to worry about. However, I have been distracted by having to deal with other issues that are taking some of my time, which may end up delaying posting in the coming weeks. No fear though, I will be trying to do more as soon as I am able to and will let you know in a blog as soon as I do. This sounds like a neat idea. There is a discussion about removing invisibility on the forums http://social.bioware.com/forum/1/topic/164/index/7827668. I posted a like to your blog as there was mention about a gui. That's interesting. I can see why people considered removing the ability, as it does cause a great deal of problems for the game if not considered properly. Even now, I am still trying to consider places where the ability could cause issues (i.e. break plot, etc.) I will take a look at that link to the forums.